It’s been a while since my last blog post, but the ALM team at Application Insights has been working hard on brand new functionality. Today I’m going to discuss work item integration with Visual Studio Team Services (aka VSTS). 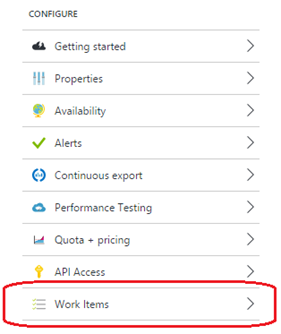 Work item integration functionality allows you to easily create work items in VSTS that have relevant Application Insights data embedded in them. It is very straightforward to configure this association and begin creating work items (this process should only take a minute or two). 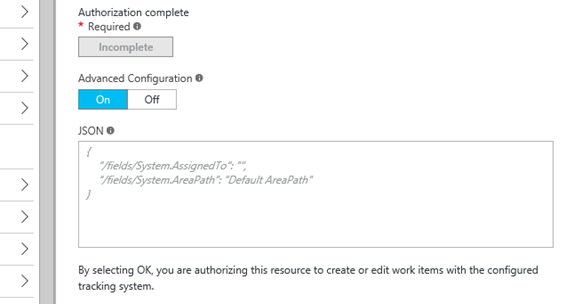 Once you’ve completed the authorization process, you can set defaults for “area path” and “assigned to." Only area path is required (if you haven’t set up specific area paths in your project, that’s ok. Just use the name of the project, as it is the top-level area path. Click OK, and assuming you’ve entered everything correctly, you’ll see a message stating “Validation Successful” and the blade will close. You’re now ready to start creating work items! As you can see, just about everything you need in your average scenario has been filled out for you. The default values for "area path" and "assigned to" that you designated in the initial configuration are set, and all of the detail information we have available for this exception has been added to the details field. You can override the title, area path and assigned to fields in this blade if you wish, or you can add to the captured details. When you’re ready to create your work item, just clicked on the “OK” button, and your work item will be written to VSTS. Some of you may have noticed that there is a switch on the configuration blade that is labeled “Advanced Configuration.” This is additional functionality that we’ve provided to help you configure your ability to write to VSTS in scenarios where you’ve changed or extended some of the out-of-the-box settings. A good example of this is designating additional required fields. Currently, there is no way to handle this additional required mapping in the standard config, but you can handle it in advanced mode. You can see that you are now given a JSON-based editing box where you can specify all of the particular settings/mappings that you might need to handle modifications to your VSTS project. Some sample text is filled in for you. In the near future, we plan to enhance this control with intellisense as well as publish some basic guidance to better understand the advanced configuration mode. Support for all work item types – You probably noticed that the current feature set locks the work item type to just “bug.” Logging bugs was our primary ask for this space, so that’s where we started, but we certainly don’t think that’s where things should end. 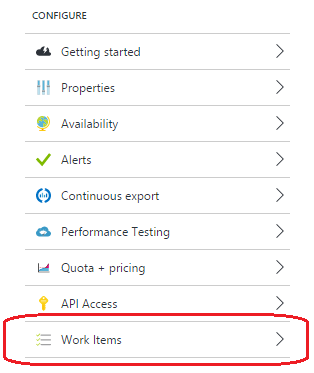 One of the more near-term changes that you will see is to handle all work item types for all supported processes in VSTS. Links back to Application Insights – It’s great to be able to create a work item with App Insights data in it, but what happens when you’re in your ALM system and looking at that item and want to quickly navigate back to the source of the work item in App Insights? We plan to add links to the work items in the very near future to make this as fast and easy as possible. 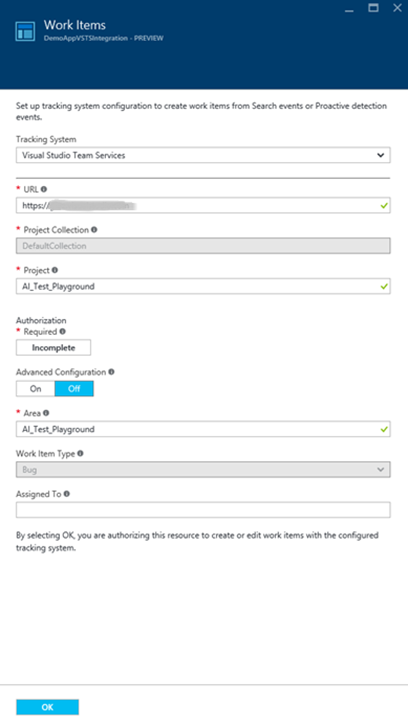 More flexible configuration – Currently, our standard configuration only handles scenarios where the user has not significantly modified/extended their project in VSTS. Today, if you’ve made these kind of changes, you’ll need to switch to advanced configuration mode. Going forward, we want to handle common things that people might change (e.g., making additional fields required, adding new fields) in the standard configuration wherever possible. 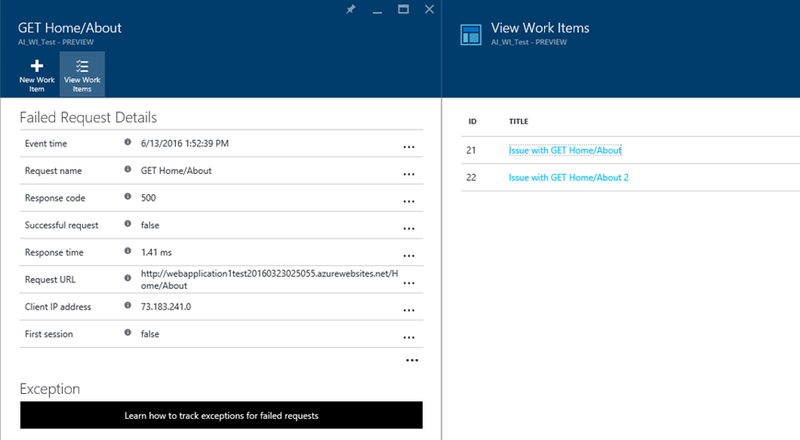 This requires some updates from our friends on the VSTS team, but they are already working on some of these for us. Once they’re available, we will begin to make the standard configuration more flexible. In the meantime (and in the future), you can always use the advanced configuration to overcome any limitations. 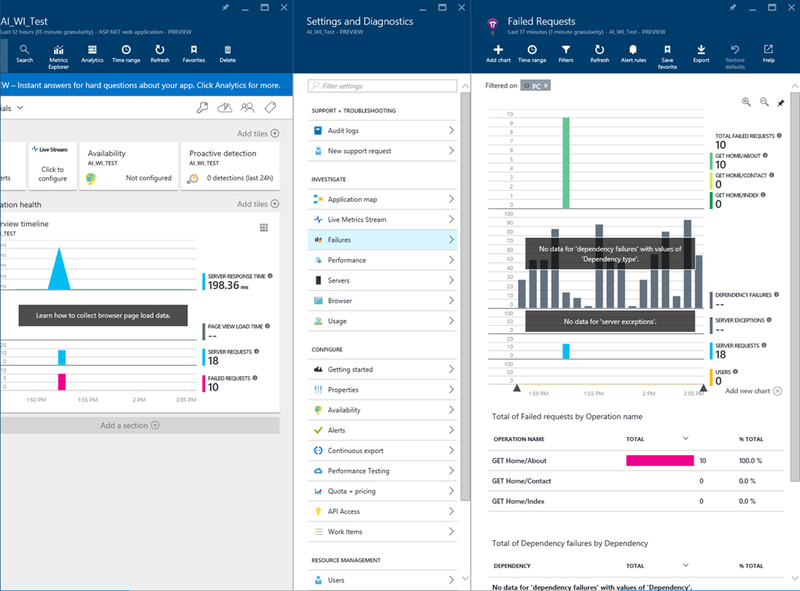 Multiple profiles – Setting up a single configuration means that in shops where there are several ways in which users commonly create work items, the people creating work items from Application Insights would have to frequently override values. We plan to give users the capability to set up 1:n profiles, with standard values specified for each so that when you want to create a work item with that particular profile, you can simply choose it from a drop-down list. 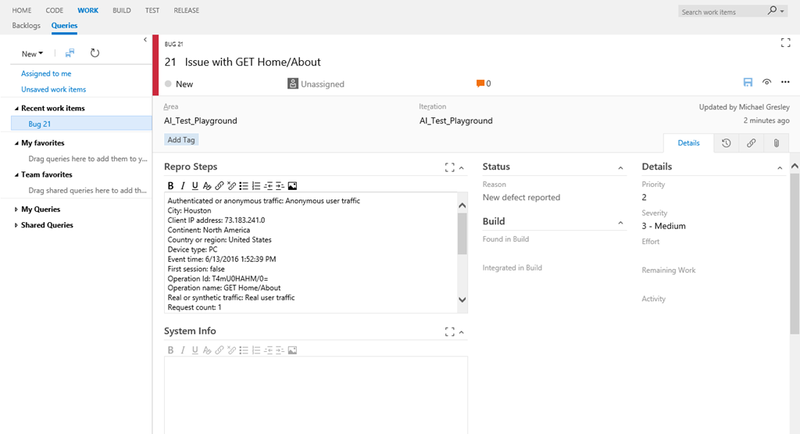 More sources of creation for work items – We will continue to investigate (and take feedback on) other places in Application Insights where it makes sense to create work items. Automatic creation of work items – There are certainly scenarios we can imagine (and I’m sure you can too) where we might want a work item to be created for us based upon criteria. This is definitely on the radar, but we are spending some design time with this to limit possibilities of super-noisy or runaway work item creation. We believe that this is a powerful and convenient feature, but we want to reduce the potential for spamming the ALM system as much as possible. Support for other ALM systems – Hey, we think that VSTS is an awesome product, but we recognize that many of our users may use some other product for their ALM, and we want to meet people where they are. So, we are working on additional first-tier integrations of popular ALM products. 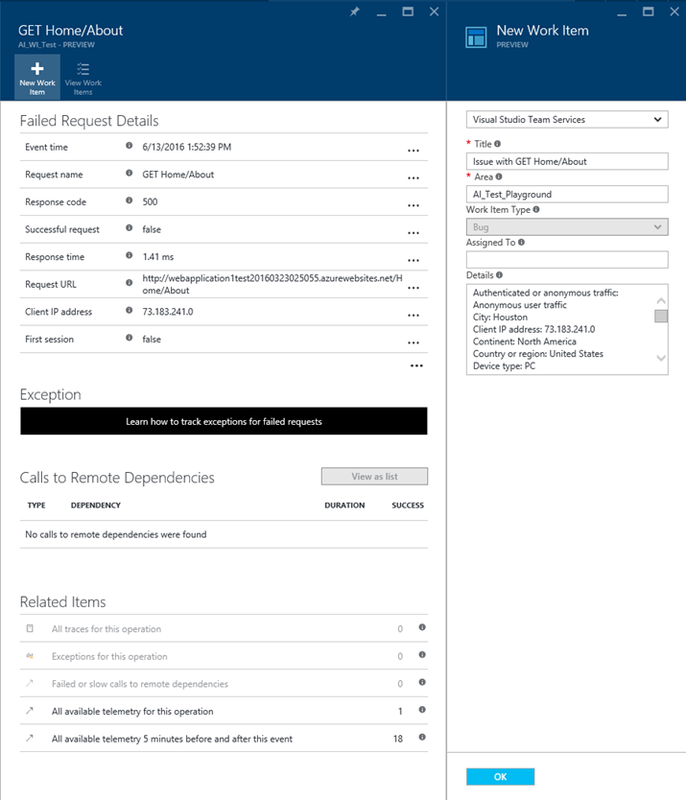 We also plan to provide a pure custom configuration choice (similar to advanced config for VSTS) so that end users will be able to hook up Application Insights to virtually any ALM system. There are other things in the pipe as well, but as you can see, this is a pretty significant list of things to work on in the near term. We’ll keep you updated as these feature evolve, and please let us know how the current functionality is working for you and what other suggestions you may have to improve this feature set. 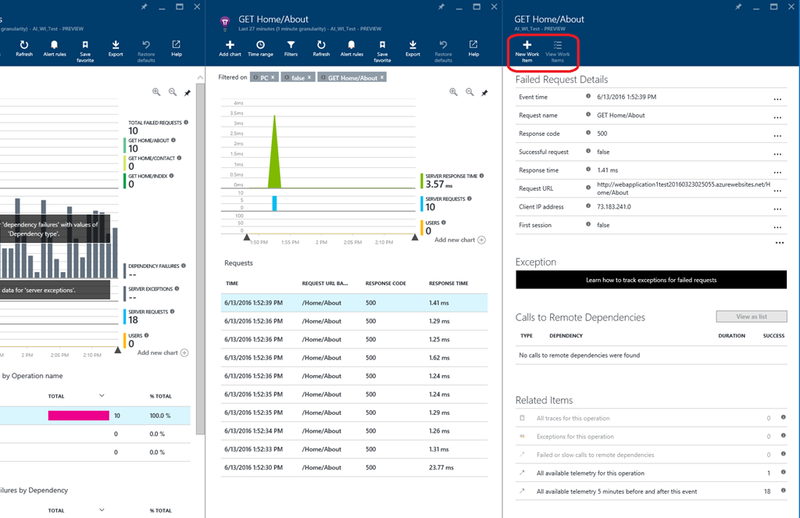 We hope that this is a good start to help you integrate your Application Insights telemetry into your everyday workflow, and we will work to continue to improve the experience. We have more coming for you very soon, so please keep an eye on my posts here on the Azure blog for new announcements! 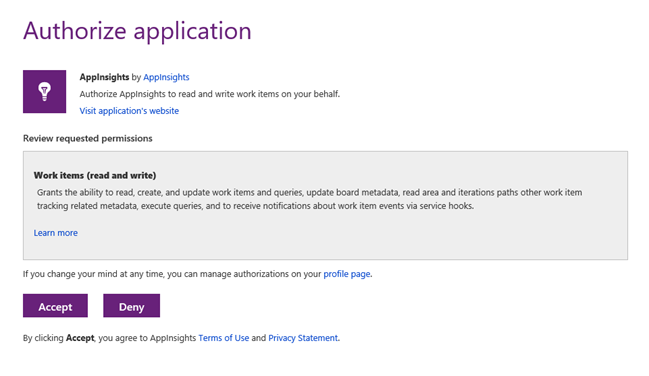 As always, please share your ideas for new or improved features at the Application Insights User Voice page, and for any questions, visit the Application Insights Forum.